Hands across the sea? No, not in this case. More like hearts across the border. The story started in the historic town of Patzcuaro, Mexico, where Everett Rolff, past president and active member of the Vallejo Rotary Club has been a frequent visitor. And the story's end reflects a cosmopolitan effort made by Northern California ethnic groups to support a children's library in the small Mexican villiage. Rolff first saw the possibilities of the project in 1965, when Patzcuaro's children's library was housed in an abandoned convent. "The only books in the building were donated by retired American residents," he explained. Soon the convent was no longer available, and a local banker lent a small store room for the library. "The Plans to provide a new library for the youngsters were initiated by Mr. and Mrs. Hugo Van Arx," Rolff said. Van Arx has retired in the Mexican town,once the capital of the Terascan Indians, from his duties as a business manager of a national magazine. Finally a plan for a new building was approved, whereby the community would raise one-third of the funds, with government assistance acquired for the remaining two-thirds. The Vallejo Rotary Club, acting on Rolff's suggestion, decided to provide equiptment for the new library's office, using funds from a well-received International Gourmet Dinner. The dinners have continued for the last four years, with representatives from local ethnic groups, including Filipino, Greek, German, Guamanian, Hebrew, Mexican, Norwegian, American, and Portuguese preparing specialty dishes from their countries. Vallejoans soon learned that the event is an outstanding experience in good eating and a yearly highlight in Rotary activities. The most recent local dinner was held at Dan Foley Cultural Center in April with Jerry Nickolatos as general chairman. But Vallejo wasn't the only community arranging such an event. 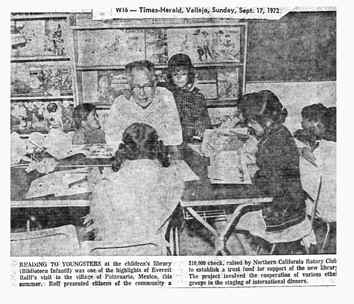 Rotary District Governor Ross Lawler grew interested in the Mexican children's library and established the project district-wide. Forty-two clubs, from Mt. Shasta to Berkeley, participated, each group staging an international dinner. The $10,000 raised from the district efforts was earmarked to establish a trust fund for Biblioteca Infantil, the newly-built library and cultural center for children in Patzcuaro. SO IT WAS with pride and pleasure that Rolff returned to the village in Mexico this year. He and current District Governor Ross Lawler made the trip to present the $10,000 check to Dr. Jose Miguel Rizo, Rotary district governor in Mexico, to be turned over to library trustees. Rolff notes that Dr. Rizo is acquainted with descendants of the Vallejo family that settled our own California territory. "Mention Vallejo in Patzcuaro and the citizens will greet you warmly," Rolff said. During their stay, Mr. and Mrs. Rolff toured the beautiful new library building and he visited with the Patzcuary children, reading to them in both Spanish and English. The building not only houses books printed in both languages, but also features facilities for craft activities. Historic Patzcuaro ("Place of Stones") lies approximately 200 miles west of Mexico City, near Morelia. These stones or foundations were named "petatzecua" by the Terascans who found them at the sites of ruined temples of an earlier civilization. ACCORDING TO Rolff, the traveler approaching from the north skirts farm and grazing land along the shores of Lake Patzcuaro for a short distance before entering the town limits. The highway then becomes tree-lined Avenida de las Americas, which leads gradually uphill for about two miles toward the tiled roofs and cobbled streets on steeper slopes at the center of town. Here, al centro, the visitor encounters colonial Patzcuaro with its picturewque squares, churches, mansions, and fountains, built between 1521 and 1810, many of which are still in use. The climate of Patzcuaro is temperate, he reports, and its days are comfortably warm during all four seasons. During the rainy season, which begins in May and ends in October, wet afternoons are perfect for visits to historic buildings, the Museum of Popular Arts, and various workshops that produce the handicrafts for which the village is noted. Rainy days are ideal, too, for a visit to Biblioteca Infantil, supported through efforts of California ethnic groups who joined together with Rotarians in a program of American goodwill and fellowship toward Mexican neighbors.